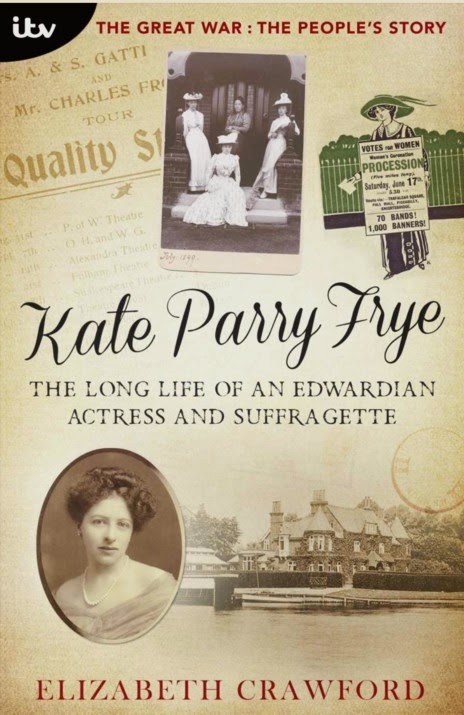 After reading Kate Parry Frye's suffrage diary, Campaigning for the Vote, last month, I was keen to discover more about her life. So, I was very happy to discover that Elizabeth Crawford, the editor of Kate's diary, had written a biography of Kate to tie in with the ITV series The Great War : The People's Story. Kate, played by Romola Garai, featured in one of the episodes. The epigraph for this book quotes the beautiful final words of Middlemarch, "To all those women down the ages who, in the words of George Eliot, have 'lived faithfully a hidden life, and rest in unvisited tombs'." This quote is so perfect for Kate. I came to feel so much affection for her & her husband, John, & let's face it, there are so many more of us living ordinary, hidden lives than there are living famous lives. I loved finding out more about Kate. I described Kate's early life & her years as a suffrage campaigner in my review of her diary so I'm going to concentrate on her life after WWI & some of the things that struck me as I read the book. Kate's work as a suffrage organiser was crucial not only for her own support, but also to help her mother, Jenny, & sister, Agnes, after the death of Kate's father, Frederick. Frederick Frye & his family had come down in the world. His successful grocery business had failed & the family spent the last years of his life moving from one house to the next, trying to survive on a very limited income. Without the help of relatives, their lives would have been extremely difficult. It didn't dampen our ardour and we were in holiday mood. First to the Army & Navy Stores - to buy the wedding ring. I asked in a most careless tone as if I was in the habit of buying them daily. We got one at length - 26/- - off a dignified gentleman who grew very friendly under our influence. Then we decided to have lunch and decided on the 2/- menu but our Waiter took such a fancy to us he gave us all sorts of extras and we laughed till we cried. John Collins had been in the Territorial Army before the war & served in the Essex and Suffolk Royal Garrison Artillery. He served in France & was awarded the Military Cross. John & Kate managed to enjoy themselves on the few times he had leave but parting was always hard, especially in December 1916, when they had been married less than two years but had spent most of that time apart. We woke up fairly early but when we were called at 7.30 it seemed like the death knell. I was the first to get out of bed as soon as John would let me go and we both dressed and had breakfast together. I cut sandwiches and stowed them in his knapsack... I stood talking to John and stood quietly apart when the train came in - a special - at 10 minutes to 1 - full of soldiers - another Battery. The Commandant was there to see them off, I walked right up to the train when John had found his whereabouts and carriage and stood talking... He got in and kissed me and the train moved off. He looked at me - then turned his head - I suppose he could not bear any more. But I smiled at him - then the train went faster. I just moved down the platform to avoid the official group and waved until he was out of sight. I think I had a great feeling of thankfulness that it was over and that I had come through such a terrible ordeal. After the war, money was often short. John attempted to go back to the stage & had some short-term engagements. He had more luck as an Assistant Stage Manager & Kate even had a couple of walk-on roles. John was very involved with several voluntary organisations, including St Johns Ambulance & during WWII, was an ARP warden. John inherited a house in Knaresborough from an aunt &, in 1921, they were eventually able to buy some cottages from Kate's Gilbey relations, which gave them a home for themselves as well as Kate's mother & sister, as well as the rent from the other tenants. Nevertheless, they were never really well-off. She died just before 8.30. Very, very slowly running down and out and away. I was so glad to be there, but it was terrible. Our 60 years of companionship has ended. Have left Agnes safely in The Old Cottage with glorious flowers all around her. Agnes's life was wasted. She had nothing to occupy her mind but money worries & bickering with her mother. She didn't have Kate's energy or sense of purpose. I felt desperately sad reading about Agnes's life & wondering how many other women had led lives like hers where they were expected to do nothing but marry &, when they didn't marry, what happened to them? At least Agnes had her mother & Kate to care for her. I was reminded of novels like Consequences by E M Delafield & Alas, Poor Lady by Rachel Ferguson (both reprinted by Persephone) about girls who didn't marry & the sad fate awaiting them. Kate's passion for the theatre is evident all her life. She wrote plays & she & John set up a little theatre in their home where they put on plays with local volunteers. She was still going to the theatre in the final months of her life, over seventy years of theatre going. Kate & John's marriage was very happy until John began to suffer from increasing frailty & dementia in the last years of his life. This is one of the saddest parts of the story. Kate looked after John at home for as long as possible but eventually he was certified insane & committed to an asylum, as no nursing home would take him & they couldn't afford the fees of a private home. Movingly she describes him as "a Prisoner of War in his own cell and I cannot get to him or give him any help." When Kate visited him, his confusion & distress were painful to see. All that seemed to have survived was his overwhelming love for her, which had been there from the beginning of their relationship. I sometimes feel half alive - brain and body. I don't actually feel lonely only I don't think I quite take it in. And what must be missing is the continual reminder of his abiding love as it was - and still is. I have always thought that no one could be quite so much loved for so long as I have been by John. Once or twice in this terrible illness he has said something that I could not believe he would ever say - just when he was at his most mental upset. And then next minute he was, as ever, crying out for me and saying how he loved me that there had never been anyone like me in all the world and that I was his own 'dear dear Mussie'. And now I seem to have forsaken him and left him to this awful doom. John died in 1958. Kate lived on in their home with the help of her kind neighbours. The final entry in Kate's diary is on October 1st that year. She died four months later, at the age of 81, in a nursing home in Beaconsfield. The cause of death was cerebral thrombosis & Elizabeth Crawford surmises that she may have had a stroke not long after she wrote that final entry & was in the nursing home for those last few months. Kate's story is so involving because, in many ways, it is such an ordinary life. 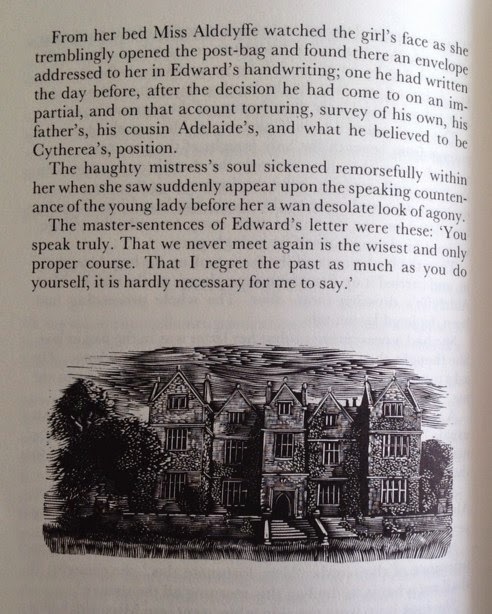 The wonder is that she kept her diary for over seventy years, and then, that Elizabeth Crawford discovered the diaries, damp & mildewed, fifty years after Kate's death. Kate was an energetic & determined woman, becoming an actress in a period when women, especially comfortable middle-class women, didn't go on the stage & becoming involved with the suffrage campaign when it attracted a lot of ridicule & disapproval. Kate was a doer, she got on with what needed to be done, whether it was putting up with dirty conditions & outdoor toilets (one of her pet hates) when she was a suffrage organiser or looking after her mother & sister after her father's death. There's so much I haven't mentioned. I've always loved reading diaries & Kate & John's experiences during WWII were fascinating as I love Home Front stories. I loved learning more about her life & the many extracts from the diaries allowed Kate's voice to be heard again. I grew so fond of her that I was distressed by John's illness & then, Kate's final months after he died, having outlived all her family & close relatives. Kate wanted to be remembered &, through her diary, & Elizabeth Crawford's determination to tell her story, she won't be forgotten. There's lots more about Kate, including many photos of her, John & her family, at Elizabeth's website, Woman and Her Sphere. Kate's story is available as a Kindle ebook. Spring has arrived in Melbourne & this poem feels right for the season. Housman reminds me of Thomas Hardy in his ability to find the melancholy side of almost any situation. This young man may be honest & true but I think his lady love is right to be cautious. Where should I begin in reading a series? I was confused when I looked at a list of titles in C P Snow's Strangers and Brothers series & I think I'm still a little confused after reading George Passant, which was the first book published in the series but is not the first book chronologically. It was originally titled Strangers and Brothers, which became the name of the series & I'm not sure when it was retitled George Passant. If you look at the list here, you'll see that several of the books were published out of chronological order. I had differing advice from the members of my online reading group as to whether it did or didn't matter which order I read the series & I realised that I'd read The Masters years ago & had no memory of the plot at all. 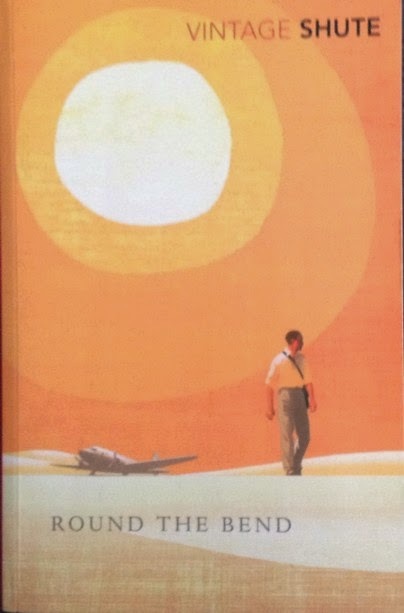 In the end, as I'd borrowed the ebook of George Passant from my library, & was three chapters in, I decided to carry on regardless although I've also borrowed Time of Hope (3rd book published but 1st chronologically) & I'm keen to read that next to fill in some gaps. I'm also interested to learn more about how Snow wrote & plotted the series. He wrote George Passant nine years before Time of Hope so did he have the whole plot mapped out first or did he write George Passant & then decide to fill in the gaps of Lewis Eliot's life? Anyway, I should probably write something about the book instead of trying to make sense of the bigger picture. Lewis Eliot is the narrator of all eleven books in the Strangers and Brothers series & at this stage he's in his early 20s, working in London as a barrister but occasionally returning to the provincial town where he grew up. George Passant is in his late twenties, a few years older than Lewis & his friends. They look up to George & see him as someone to refer to when they're in trouble. Jack Cotery is in trouble at the beginning of the story. Jack is a clerk in the local newspaper office. Roy Calvert, the 15 year old son of the owner, has become infatuated with Jack & has given him an expensive cigarette case & written him a letter which his father has seen. Mr Calvert has been paying Jack's fees for a printing course at the Technical College (known as the School) with a view to offering him promotion at the newspaper. All this is now over & Mr Calvert tells Jack that there will be no promotion for him & his fees will no longer be paid. This means the end of Jack's prospects of higher education & he & Lewis decide to consult George. George works for local solicitors, Martineau & Eden, as a qualified clerk & teaches a couple of evening classes in law at the School. He has never had the money to study further but has a very high opinion of his abilities & his value to the firm. On the other hand, he is very sensitive about his social status & almost makes a virtue of not trying to better his position by attending social events where he could mix with the firm's partners. He has gathered around him a group of students who follow in his wake & admire his opinions on life. George agrees to take up Jack's cause & make a representation to the School's Governors about the injustice of Mr Calvert refusing to pay Jack's fees because of his relationship with Roy - although, of course, this is never mentioned when Mr Calvert declares his change of mind. George's interference damages his own prospects but he forges ahead regardless. He even loans Jack money he can ill afford to start up a business when Jack has to accept defeat & leave the newspaper. George becomes more involved in Jack's schemes & this leads to trouble. Jack becomes involved with Olive Calvert, Roy's sister, & his money making ideas become more shady as time goes on. George becomes a partner with Olive & Jack in an advertising firm & they're accused of misrepresenting the financial position of the company to the people Jack persuaded to invest capital. They also have another scheme to buy the farm that George has been renting for their weekends & turn it into a hostel. The three of them are charged with fraud & sent to trial. Their defence is conducted by Getliffe, a barrister from Lewis's chambers in London (this was one point when I wanted to know more about Lewis & his life as there's obviously some history between Lewis & Getliffe but nothing's explained in this book). The trial itself is very tense as the exact degree of knowledge George had about Jack's activities is teased out by Lewis through talks with George & extracts from his diary. The jury & spectators disapprove of all three defendants & their lifestyle but will that be enough to convict them if the evidence is less than overwhelming? I found George Passant to be an intriguing novel that has made me want to read more of the series. I want to know more about Lewis Eliot, the references to his life in London, his relationship with Getliffe & with Sheila, his future wife, are elusive in this book. I think I probably do need to read the books in chronological order so Time of Hope, which tells the story of Lewis's childhood, will be next. Does anyone remember the 1980s TV series of Strangers and Brothers? It's just about to be released on DVD in the UK & it would be good to know if it's recommended. 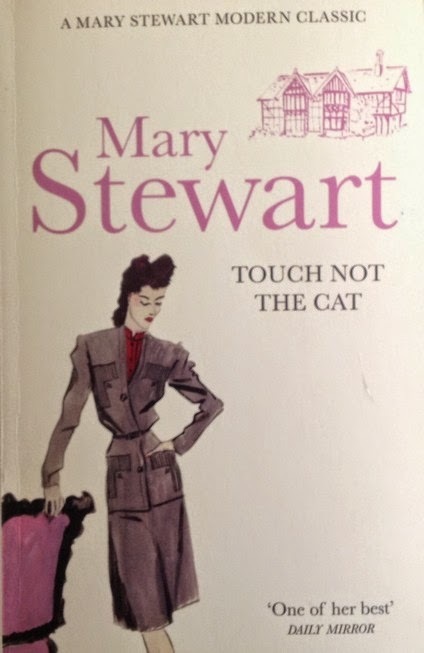 I realise I'm a few days late for the official Mary Stewart Reading Week but I did want to post a review of Touch Not The Cat, so I hope I can be forgiven for extending the Week for a couple of days. I remember reading this book when it was first published in the 1970s & I still remember the striking cover image of a mosaic cat which is much more appropriate than the image used here on the latest reprint. I've liked most of the images used by Hodder for these reprints but this one is completely wrong. The book takes place in the mid 1970s in May & I see Bryony wearing cheesecloth & going barefoot (as she does several times in the story) rather than wearing a winter tweed suit that looks 1940s to me. However, that's a minor quibble that didn't prevent me enjoying the book just as much this time around. Bryony Ashley has a gift that has been passed down through the Ashley family from a distant ancestor, Bess, who was burned as a witch in the 17th century. Bryony has always been able to communicate telepathically with another Ashley, but unfortunately she doesn't know which one. She assumes that her Lover, as she calls him, is another member of her family because of the Ashley gift. Bryony has three male cousins, twins Emory & James, & their younger brother, Francis. She feels so close to her Lover that they are able to communicate with complete honesty, no matter how far apart they are. Bryony is desperate to find out who her Lover is but he continually puts her off, saying the time isn't right. Bryony & her father, Jonathan, live at Ashley Court, the family estate which has diminished in grandeur since the house was first built. The Ashleys now live in a cottage on the estate, renting out the Court to a rich American family. The state is bound by a Trust that has several restrictions put in place by William Ashley, the 19th century owner. Only male heirs can inherit & every member of the family must agree to the sale of land or property. Jonathan Ashley dies as the result of a hit & run accident in Germany, where he was receiving treatment for heart trouble. When Bryony arrives at the hospital, his doctor tells her of Jonathan's last words, a message warning Bryony of danger & giving her clues to a mystery at the heart of the Ashley inheritance. Bryony returns to Ashley Court to try & unravel her father's warning & discover the identity of her Lover. The estate now belongs to her cousin Howard, father of Emory, James & Francis. He's a very ill man, living in Spain, but the twins are running their family business which has always been prosperous. All Bryony now owns is her father's cottage & she decides to stay on for a while & decide what to do with her future. She is happy to be at home with the people she's known all her life, including the Vicar, Mrs Henderson & Rob Granger, a childhood friend who works on the estate. Bryony notices that some valuable objects are missing from the Court & discovers that her cousins have anticipated the settlement of her father's estate to sell them. Their business isn't as successful as Bryony had thought & inheriting the Court hasn't made their financial problems any easier. Bryony sees a more ruthless side to Emory & James as they try to push her into agreeing to sell the Court & her own cottage which has vital access for the developers who want to build on the land. She still isn't sure which of her cousins is her mysterious Lover but she only grows more confused as she discovers that her father's death may not have been an accident & begins to unravel her father's last warning. Touch Not The Cat is an absorbing story that had me hooked from the beginning. I love books with a supernatural air & Bryony's telepathic communication with her mysterious Lover was unsettling & exciting. I also enjoyed the historical aspect of the plot as the story of the 19th century Ashleys, the maze they built with a pavilion at the centre that was used for lovers meetings & the story of the family's crest all have a part to play in the mystery at the heart of the story. Mary Stewart describes landscape & the countryside so beautifully. I always enjoy her evocation of place & atmosphere & the English countryside in May is such a peaceful setting for this story that's full of suspense & mystery as well as romance. There's a copy of Touch Not The Cat as well as other books by Mary Stewart, available to buy from Anglophile Books. Something a little cheerier than last week although there's still melancholy in this lovely poem about an old man looking back on his life. Another poem set to music by George Butterworth & sung here by Bryn Terfel. 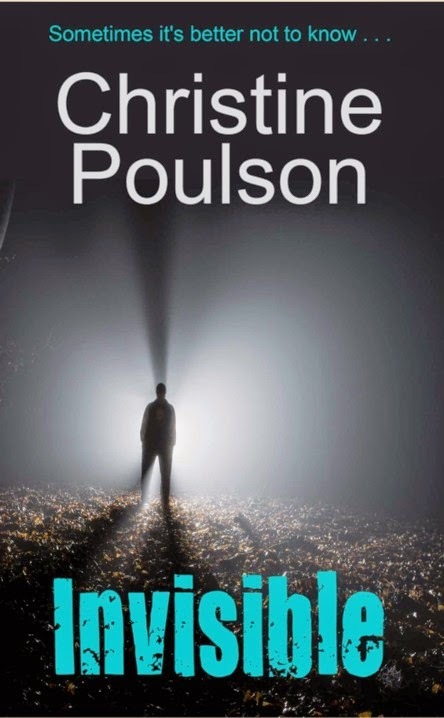 Amazon US has the Kindle edition of Christine Poulson's thriller, Invisible, for just 95c US at the moment. Click on the title link for my review. It's one of the best thrillers I've read this year, highly recommended. This book has been on my shelves for many years. I've dipped into it before but never read it all through. After reading Helen Rappaport's wonderful Four Sisters earlier this year, I wanted to read more about the Romanovs & this book was perfect. It's a selection of the letters, diaries & memoirs of Nicholas, Alexandra, other family members, servants & other observers to the events of Nicholas's reign. The tragic story of the last Tsar & his family is well-known. As I was reading A Lifelong Passion, I was struck by just how early on in Nicholas's reign the portents of disaster began. 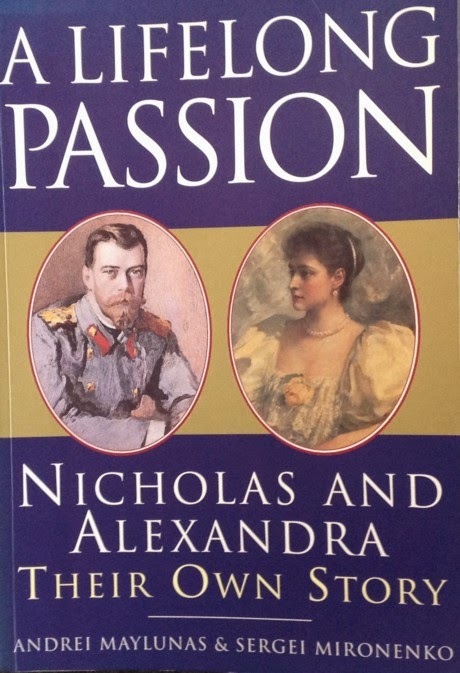 The personalities of Nicholas & Alexandra & the way they reacted to circumstances determined the course of their lives. The book begins with an account of the assassination of Tsar Alexander II in 1881. Known as the Tsar-Liberator because he liberated the serfs, Alexander was succeeded by his son, Alexander III, who became one of the most reactionary & autocratic of Tsars in reaction to what he saw as the failure of his father's liberal ideals. Alexander III dominated his son, Nicholas, who led an idle life in the Army & society. At a family wedding, Nicholas met Alix of Hesse, a princess of a minor German royal house & a granddaughter of Queen Victoria. Alix's mother had died when she was young & Victoria had virtually brought up Alix & her sisters. Alix had been a happy child but the deaths of her mother & two of her siblings changed her personality & she grew up a serious, melancholy girl. She was also very religious & the great stumbling block to her love for Nicholas was religion. Alix was unwilling to convert to Russian Orthodoxy & it took years to overcome this resistance. Alix's sister Ella had married one of Nicholas's uncles, Serge, & her influence was crucial in the engagement eventually taking place. Alix became a passionate convert to Orthodoxy &, as tragedy consumed her personal life, she became more & more religious which led to an estrangement from Russian society & her dependence on mystics such as Rasputin. Alexander III died suddenly in 1894 at the age of only 49. Nicholas had no training for his destined role & his personality was not suited to playing a dominant role. Nicholas also had several very domineering uncles who saw him as a weak personality who needed bolstering. He reacted with polite attention which gave the impression that he agreed with the last person he spoke to but which often left people feeling that he had deceived them. Alix, on the other hand, was stubborn & strong-willed, always pushing Nicky to impose his will on his Ministers & be a strong Tsar for the Russian people. This was a disastrous combination. The saving grace from a personal point of view was their great love for each other. This never wavered from their earliest days together until the end & is expressed in passionate terms in their letters & diaries in this book. Their marriage began in the tragic circumstances of Alexander III's death. Alix was summoned to Livadia to be present at the Tsar's deathbed & she & Nicky were married just weeks later & the superstitious Russians said that their new Tsarina had come to them behind a coffin. From that moment, nothing seemed to go right. The coronation was marred by the tragedy of the stampede at Khodinka Meadow, when hundreds were killed as they tried to get hold of souvenirs. The new Tsar went to a reception that night which gave a bad impression. Alix was shy & uncertain in society, in contrast to her mother-in-law, Maria Feodorovna, & the mistakes she made in the early days were never forgotten or forgiven. Alix's religious fervor was also wondered & laughed at by sophisticated Russian society. Four daughters were born over the next six years, each one loved by their parents but the rest of the family despaired over the lack of a male heir. Alix's desire for a son led her to consult quacks & religious mystics. When the longed for son, Alexei, was born in 1904, he suffered from haemophilia. Alexei's illness dominated Alix's life from that moment & led to her reliance on Rasputin, who seemed to be able to calm the boy when he was ill. The family also isolated themselves at Tsarskoe Selo, preserving their happy family life but distancing themselves from the rest of the family, society & the people. Politically Russia was also in revolutionary mood. The Bloody Sunday massacre in 1905 & the Russo-Japanese War led to demands for democracy but Nicholas was reluctant to grant any power to the people. Bolstered by Alix, he stubbornly vowed to uphold the autocracy of his ancestors. Russia's lack of preparedness for WWI led to enormous losses on the battlefield & Nicholas's decision to take over as Commander in Chief of the Army was a fatal mistake. Revolution in 1917 led to Nicholas's abdication, imprisonment with his family at Tsarskoe Selo, then Siberia & death in Ekaterinburg in 1918. Whether Nicholas could have done anything to avert the disasters of his reign if he had been a different man or if he had married a different woman, is a question that is impossible to answer. There are so many What Ifs in the story of the last Romanovs which is why it's so interesting to read these firsthand accounts. It's so interesting to read how concerned Nicky's family were about the isolation of the Royal Family. Right from the very beginning of his reign, there was concern that Alix was avoiding her duties to society, but as the family grew & especially after Alexei was born, the desire to be completely private & especially not to allow anyone outside the immediate family to know of Alexei's illness, became more obvious. Nicky's sisters, Olga & Xenia, write in their letters & memoirs of their concern at the Tsar's isolation. The wider Romanov family were bewildered & concerned. Many of them grew to resent Alix & blame her for the increasing discontent in Russia, including her own sister, Ella, from whom she was increasingly estranged. The most interesting sections of the book are the Diaries of Konstantin Konstantinovich, known as KR. KR was a cousin of Nicky's, the grandson of Tsar Nicholas I. He was a writer, poet & translator; he translated Hamlet into Russian. He was a devoted husband & father of nine children but he was also bisexual which caused him great anguish. It also left him open to blackmail & he struggled with this although there was no open scandal. KR was one of the few Romanovs who were close to Nicky & Alix right up until his death in 1915. By then, it was too late to save the dynasty. Alix was virtually running the country when Nicky was at the Front & her letters to him are full of exhortations to be strong & save the throne for Alexei. Her letters become more & more unbalanced & it's hard to imagine how Nicky must have felt when receiving yet another letter full of advice about ministerial appointments from his wife with total reference to Rasputin. The eyewitness accounts of Rasputin's murder, & the murders of members of the Imperial family are also fascinating.The most poignant diary entries are from Alexei in captivity in Tobolsk as he writes day after day, "Everything the same." "The same as yesterday". A Lifelong Passion is a fascinating book. There's virtually no commentary from the editors, apart from chapter headings & footnotes, so the eyewitness accounts speak for themselves. With the mass of material available to them (the first draft was 2,500 pages long. The published book is 650 pages) the editors had to leave a lot out but they have done an excellent job of making a complex story coherent & allowing as many diverse voices as possible to be heard. The Memoirs may have the benefit of hindsight & self-justification (especially in the case of Felix Yusupov, one of Rasputin's murderers), but the letters & diaries are so immediate that the well-known story becomes new once more. Here they are, nos 999 & 1,000 on my tbr shelves. 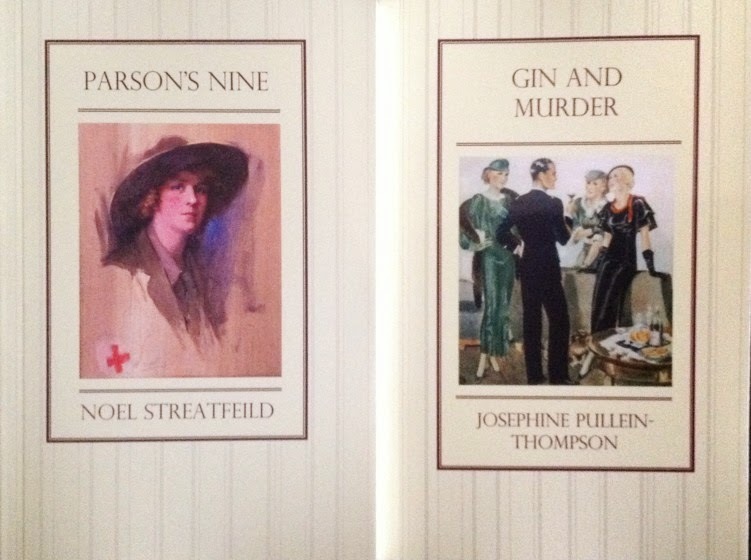 Very appropriately, they're two recent books from Greyladies, Parson's Nine by Noel Streatfeild & Gin and Murder by Josephine Pullein-Thompson. I'm so pleased that Anbolyn's Mary Stewart Reading Week gave me the incentive to reread This Rough Magic. I read all Mary Stewart's novels as a teenager in the 1970s & I bought several of the Hodder reprints a few years ago but have only read a couple of them. I was on holidays from work last week - which was meant to be relaxing but didn't turn out that way - so a trip to Corfu, even if it was only in my imagination, was just what I needed. Lucy Waring is an actress whose career has hit a bit of a lull. She's happy to swap dreary London & the demise of the play she was in, for a holiday with her sister, Phyllida, on Corfu. Phyllida is married to a rich Italian banker whose family own not only the Castello dei Fiori, but also two smaller villas nearby. Phyllida & Lucy are staying at the Villa Forli while the other, Villa Rotha, is rented to Godfrey Manning, a writer & photographer. Lucy is intrigued to discover that the Castello is home to Sir Julian Gale, one of the most famous actors of his generation. Sir Julian had suffered some kind of breakdown after the deaths of his wife & daughter in a car crash & had become a recluse. Sir Julian's son, Max, is staying at the Castello while working on a film score but Lucy doesn't expect to see very much of them as their privacy is fiercely guarded by their gardener, Adonis, known as Adoni, who lives up to his name in looks. Sir Julian has been visiting Corfu for many years & one of his most cherished theories is that the island is the site of Shakespeare's Tempest. He is godfather to Spiro & Miranda, the twin children of the Castello's housekeeper, Maria. According to Phyllida, the relationship may be even closer &, even though Spiro is supposed to be named after the patron saint of Corfu, St Spiridion, Phyllida is sure that the reference to Prospero is significant. While Miranda helps her mother at Villa Forli, Spiro has been employed to work for Godfrey Manning. As well as working on Manning's boat, he also models for photographs with a dolphin he's tamed. Lucy encounters the dolphin on one of her swims when someone starts taking potshots at it & she dives in to drive it out to sea. She also meets Max Gale on this occasion & is unimpressed by his manners. On one of Godfrey's night sailing trips to take photos, Spiro falls overboard & is presumed drowned. Soon after, a fisherman suspected of smuggling goods to communist Albania just across the ocean, is also drowned. On the night of his death, Lucy had seen this man,Yanni, on his way up to the Castello & she suspects Max of some involvement in the smuggling, especially given his suspicious behaviour when Yanni's body is found. By this time, she has met Sir Julian & been entranced by his stories of the theatre & his theories about the Tempest. Max has been watchful of his father & slightly suspicious of Lucy, making her wonder why he doesn't encourage visitors. Her increasing attraction to him is just another complication. Godfrey Manning is attractive, intelligent & very attentive to Lucy but could he have other motives for being on Corfu? Lucy becomes involved in the lives of all these people & will risk her own life to uncover the truth. This Rough Magic had just the right combination of romance, suspense & action all set in a gorgeous location. The lush descriptions of the Castello's gardens, the beaches & the surrounding countryside were so evocative. After the dappled dimness of the wood, it took some moments before one could do more than blink at the dazzle of colour. Straight ahead of me an arras of wisteria hung fully fifteen feet, and below it there were roses. Somewhere to one side was a thicket of purple judas-trees, and apple-blossom glinting with the wings of working bees. Arum lilies grew in a damp corner, and some other lily with petals like gold parchment, transparent in the light. And everywhere, roses. ... I must have stood stock still for some minutes, looking about me, dizzied with the scent and the sunlight. I had forgotten roses could smell like that. Lucy has found her way into the Castello's gardens & Sir Julian is about to greet her with a quotation from the Tempest. Lucy's encounters with the dolphin in the bay are also almost mystical. She & Max save the dolphin when it has beached itself, she swims with it & it appears at a crucial moment when Lucy is in danger. It all seems part of the magical quality of the island with its legends & religious parades, a simpler side of island life to be contrasted with the deadly serious business of evil treachery that also has its place. The last third of the book is almost unbearably tense & I sat up late one night to finish the book because I couldn't resist reading just a little more. Lucy is a resourceful heroine & although there's not much doubt where her heart lies, her ability to stay out of trouble & to stay alive is more dubious. What acting talent she has comes in very handy before the adventure ends. I'm not sure that This Rough Magic fits too many categories in Leaves and Pages wonderful Gothic Romance primer here but I just wanted to point any Gothic Romance fans to her blog anyway. I'm in awe of the amount of reading & reviewing that Leaves and Pages does & her blog is eclectic, funny & full of great recommendations of the kind of books I enjoy reading. In the post I've linked to, she reviews Mary Stewart's Nine Coaches Waiting as well as Madeleine Brent's Tregaron's Daughter & Georgette Heyer's Cousin Kate, rating all three according to her own taste as well as the Gothic Mystery criteria. 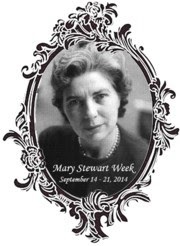 Mary Stewart comes out on top with 10/10. Very appropriate for Mary Stewart Reading Week. 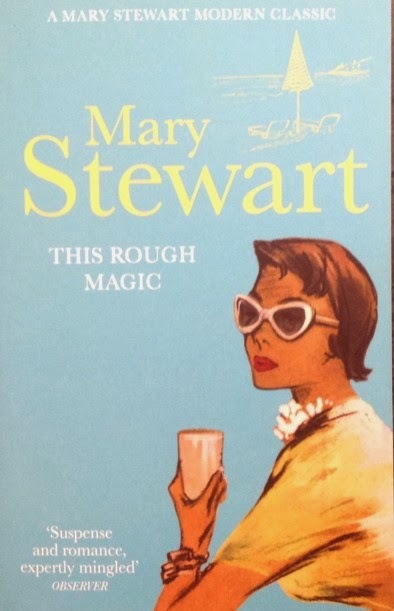 Copies of This Rough Magic, as well as several other Mary Stewart titles are available from Anglophile Books. As I mentioned in yesterday's post, I'll be featuring Housman's A Shropshire Lad here for the next few weeks. Even though the poems were published in 1896, for me, many of them are inescapably connected to WWI. I think it's because several of the poems were set to music by George Butterworth, who was killed in 1916. I recently listened to a radio documentary about some of the composers involved in the War which reminded me of these poems. I've also become addicted to BBC Radio's drama series, Home Front, which is set in Folkestone during WWI & is ambitiously planned to run for the next four years, with a 15 min episode every weekday. I've been catching up with the omnibus episodes, thanks to Darleen at Cosy Books, & I'm completely addicted! 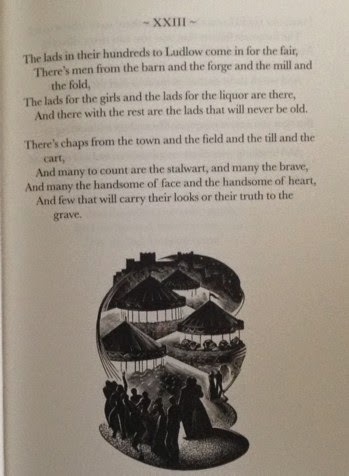 The subject matter of some of the poems is very melancholic as well, almost prophetic, as in one of my favourites, The Lads in Their Hundreds. The song setting by Butterworth is just beautiful &, of course, no one can sing it like Bryn Terfel. You'd think Phoebe didn't want me to get at those books, wouldn't you?! 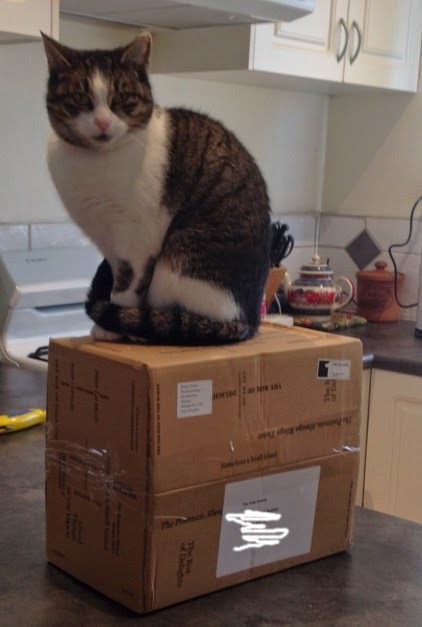 Well, this was one battle of wills she didn't win. I'm rushing towards my goal of 1,000 books on the tbr shelves with a vengeance lately. I was tempted by the Folio Society special offer for their new titles & bought these three gorgeous editions. I've always wanted to read William of Malmesbury's Deeds of the English Kings, which was written in the 12th century & tells the story of English history from the coming of the Romans to the reign of Henry I. This is the 1998 translation for OUP but with the usual attention to detail & gorgeous illustrations of Folio editions. I already own a copy of Desmond Seward's biography of Richard III, first published in the 1980s. The subtitle says it all really : England's Black Legend. Although I'm a member of the Richard III Society, I've always been interested in different interpretations of Richard's life & reputation & Seward has updated the book twice - in 1997 & again this year after the discoveries in Leicester. I'm looking forward to reading it again. 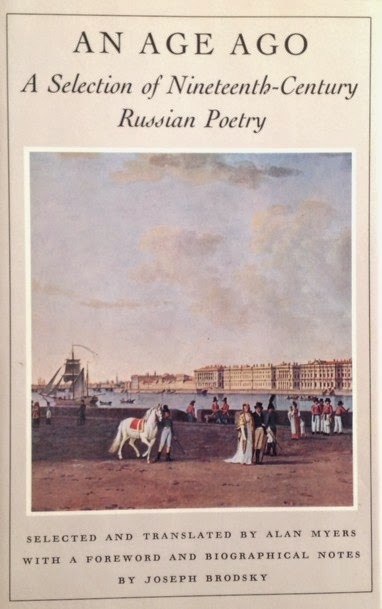 After reading Pushkin's poetry over the last few months, I couldn't resist this volume of his stories, including his most famous, The Queen of Spades. Another incentive for this little purchase was the inclusion of a free copy (yes, it was free!) 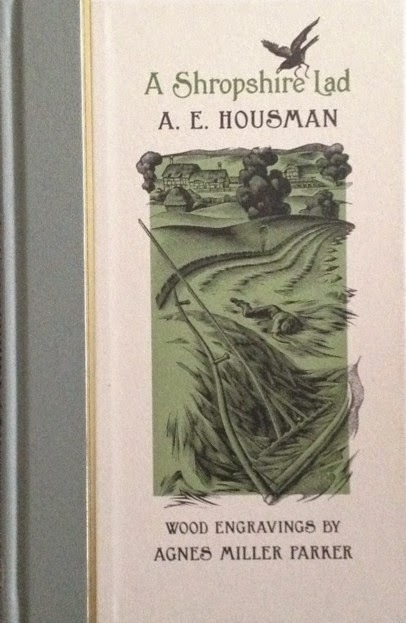 of this beautiful edition of A E Housman's A Shropshire Lad. 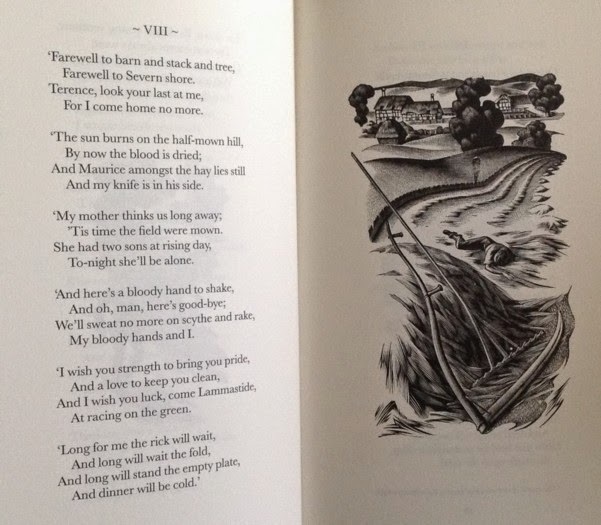 Apart from the poetry, this edition includes the woodcuts by Agnes Miller Parker that were used in the 1924 edition. I love woodcuts & these are just lovely. Here are a couple of examples. There are full page examples like these as well as little vignettes. 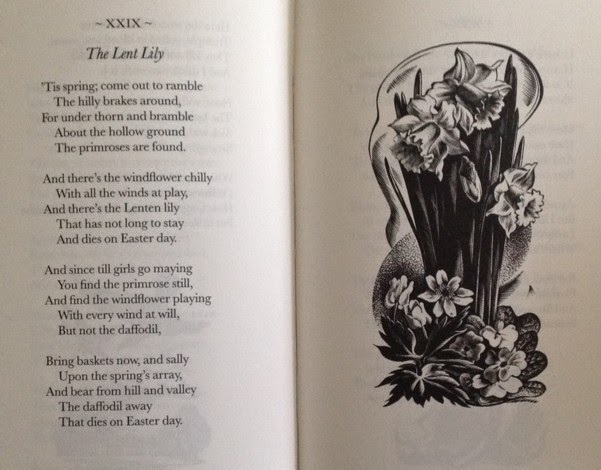 One of the joys of the early Persephone Quarterly magazines was the inclusion of woodcuts by artists like Claire Leighton, Gwen Raverat & Tirzah Garwood. This book is so lovely that Sunday Poetry will be featuring Housman for the next little while. I've also bought a couple of secondhand Folio editions. When I book my car in for a service, I often hop on the train & go to Camberwell, a suburb with a lovely Art Deco cinema (the Rivoli) & an equally lovely secondhand bookshop, Sainsburys Books. I saw a very sweet movie, Begin Again, with Keira Knightley & Mark Ruffalo, had some lunch & browsed around Sainsburys. I've bought some lovely Folio editions there &I wasn't surprised to find two more to add to my collection. The woodcuts by Peter Reddick were the attraction of this edition of Thomas Hardy's Desperate Remedies. 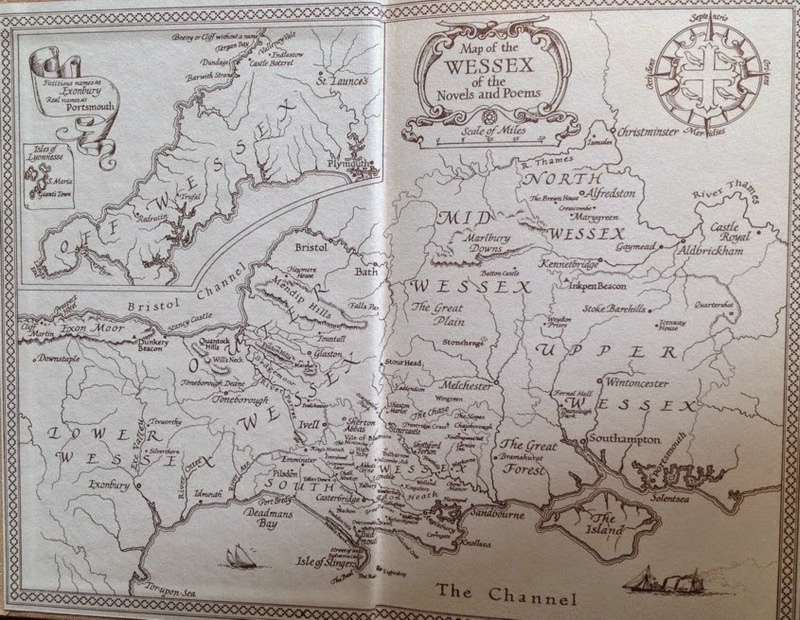 Also, the lovely endpapers with a map of Wessex. This was Hardy's first published novel & is a bit of an anomaly as it has definite elements of the sensation novel. I've never read it & look forward to seeing what Hardy does with a plot that sounds more Woman in White than Mayor of Casterbridge. 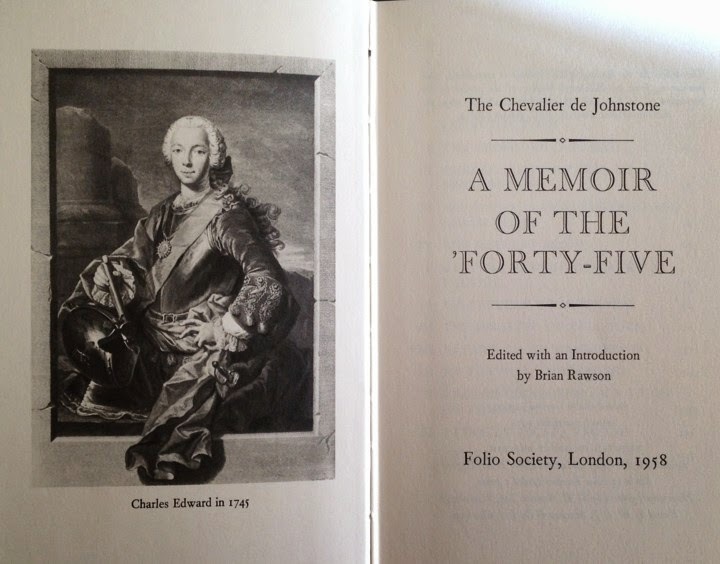 Then, there was the Chevalier de Johnstone's Memoir of the 'Forty-Five. Despite his title, the Chevalier was a Scot who rallied to the cause of Bonnie Prince Charlie. 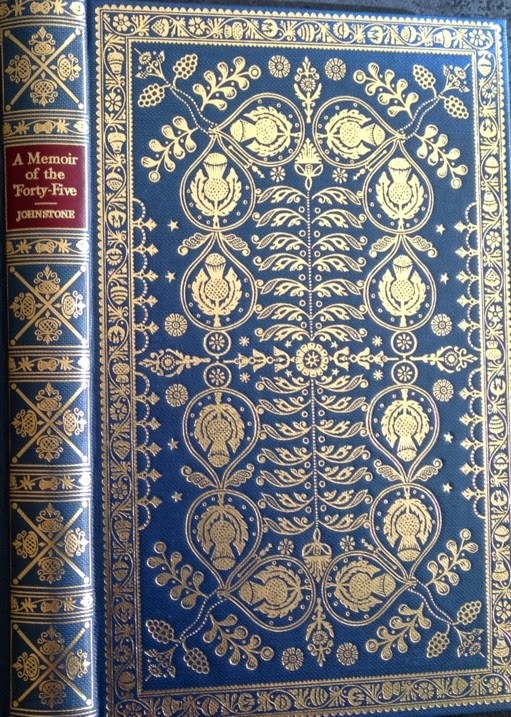 I couldn't resist the lovely binding of this copy which is based on an original binding of the period. Tom Cutter wants to fly. As a young boy in Southampton, he leaves his job in a garage to hang around a flying circus. From this first job, picking up paper & cleaning the planes, he eventually becomes part of one of the clown acts & meets Constantine Shaklin, a boy of his own age of Russian-Chinese parentage. Connie is an unusual boy with his mixed parentage & experience of living all over the world. His religious curiosity also makes him different. He goes to church, synagogue & mosque, as if he's searching for something or just exploring any idea that comes his way. Tom is intrigued but accepting of his friend's eccentricities. Eventually the circus moves on & Tom moves on with it, working on the planes in the winter, learning all he can. After a few years, the circus is wound up & Tom finds a job with an aircraft company while he waits to be old enough to train as a ground engineer. Connie goes out to live with his mother in the United States & the boys lose touch. During the War, Tom stays with Airspace as an engineer but also takes advantage of cheap flying lessons for employees & qualifies as a test pilot. He spends part of the war in Egypt, repairing crashed aircraft. At the end of the war, Tom returns to Southampton to consider his future. A brief wartime marriage had ended in tragedy &, although he's offered an excellent job, he realises he can't face staying in Southampton with the sad memories of his wife, Beryl. With his experiences in the Middle East, he decides to start a charter freight business for companies operating in Bahrain. From humble beginnings with just one old plane, Tom builds the business up through sheer hard work & rigid economy. He has no racial prejudices & employs local Arab & Asian pilots & engineers, giving them responsibility & trust. He also knows that local staff are cheaper to employ than Europeans. The change in Tom's fortunes & his life comes when he meets Connie Shaklin again. Connie is an engineer who had spent the war in Canada servicing aircraft. As a British citizen he joins up but insists that he won't fight as his beliefs do not permit him to kill. His other skills are utilised instead & after the war he went out to Bangkok & worked for Siamese Airways. Connie agrees to work for Tom & takes over the engineering side of the business. From the beginning, Connie exercises a remarkable influence over the other men. He begins an evening prayer session at which all religious groups are welcome. Connie's own beliefs are never spelled out but he begins to be seen as a prophet, even a messiah by the locals. Tom is bemused but happy to let Connie continue as his workshop has never been better run & it's obvious that his influence is good. The business grows as Tom buys more aircraft, negotiates better deals & expands operations into South East Asia. Connie's religious mission also seems to be growing in popularity until there are hundreds of people gathering at the airfield each evening for prayers. This causes some friction with the local British authorities, already a little suspicious of Tom's willingness to work with the locals & stay outside the establishment. eventually, tom is told that Connie must leave. We must look for the new Teacher. One day the Power that rules the Universe will send us a new Teacher, who will lead us back to Truth and help us to regain the Way. There have been four Buddhas in the history of this world, of whom Guatama was the last. One day a fifth will come to aid us, if we will attend to Him. Here in Burma we earnestly await His coming, for He is the Hope of the World. Connie's religious mission continues alongside Tom's more prosaic story of his business. Connie's sister, Nadezna, comes out to Bahrain to work as Tom's secretary; the business continues to expand & it becomes obvious that Connie's mission is drawing to a climax. Round the Bend is an unusual novel with a mixture of the practical & the mystical. The story of Tom's business is remarkably detailed; Nevil Shute's books all have this quality of building up the layers of detail, very practical & methodical, detailing all his decisions & contrivances. I found all this fascinating & Shute's own background in engineering is obvious. On the other hand, there's the ephemeral nature of Connie & his mission. Connie himself is modest, self-effacing but remote, rejecting all human relationships apart from his love for his sister & friendship with Tom. He seems to do very little but his influence on those around him is profound. The Christian overtones are sometimes a little too obvious, as when Tom denies that he thinks Connie has any divine qualities three times, but generally, Connie's influence is seen as a general force for good without beating a drum for any one kind of religious experience. I found that the two aspects of the story worked well together. The Middle Eastern & Asian setting helped with this, I think, as Westerners still see the East as mysterious & this plays in to our perceptions as readers, as we identify with Tom. Round the Bend is a compelling book & I found it very hard to put down. Shute's style is so matter of fact, almost prosaic, that the religious elements seem quite ordinary within the charmed circle of Tom & his company. Tom himself just accepts Connie for who he is, without prejudice, as if he has been just as affected by Connie's magnetism as the workmen who believe that he is a prophet. The reactions of others, usually Europeans, just point the difference between two vastly different ways of looking at the world. I have several other Nevil Shutes on the tbr shelves & I'm looking forward to the next one very much. The final poet in this anthology is A A Fet. Illegally adopted by his mother's husband, Shenshin, he was brought up as gentry until he was fourteen when the illegality of his mother's marriage & his adoption was discovered. It meant that he was no longer gentry & not even a Russian citizen as his mother was German. He was sent to school in Estonia, only returning to Moscow to study at the university some years later. He joined the Army as a private, his goal being to regain his gentry status by becoming an officer. Eventually he left the Army & became a wealthy landowner & poet. At the age of 53, he was reinstated to his former status by Imperial decree & allowed to use his adopted father's name. In the last ten years of his life, he published four collections of poetry, although this poem is from earlier in his career & was published in 1859. 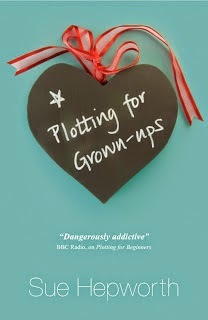 Sue Hepworth's funny, romantic, unputdownable novels, Plotting for Beginners & Plotting for Grown-ups, are both available as ebooks from Amazon at the moment for just 99c or 99p. Faith Morgan is the relatively new vicar at St James's, Little Worthy. Faith used to be a policewoman & some of her former colleagues, especially former boyfriend Ben Shorter, find her change of career, & her vocation, hard to accept. In the first book in the series, The Reluctant Detective, Faith found herself in the middle of a murder investigation when she'd only just arrived in Little Worthy. Now, when murder touches Faith & her congregation again, she finds it difficult to resist doing a little investigating of her own. Her police training & natural nosiness are an irresistible combination. Advent is a busy time for Faith. She has all her usual duties plus the Christmas pageant to organise. Churchwarden Pat Montesque never lets Faith forget just how important the pageant is to the parish & Faith's immediate problem is finding a donkey to carry Mary in the procession. 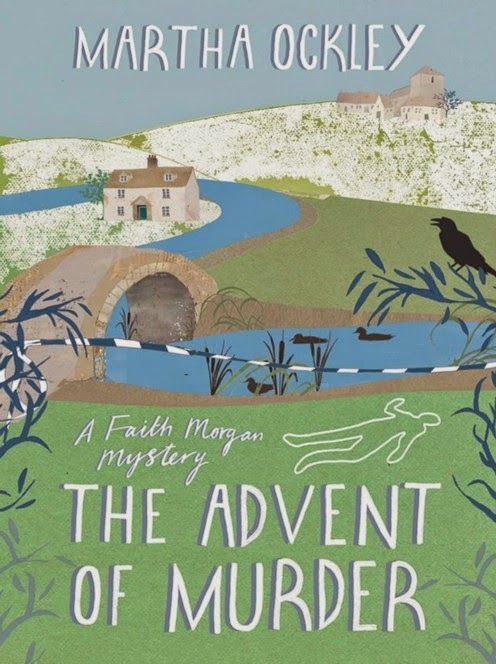 On her way to talk to new parishioner Oliver Markham, the Joseph in the production, Faith comes across a police team investigating the discovery of a young man's body by the river on Markham's land. Detective Inspector Ben Shorter is heading the investigation but Faith gets more information from Sergeant Peter Gray, a friend & parishioner. The boy, Lucas Bagshaw, has been hit on the head & had then fallen into the river somewhere upstream of the place where he was found. Faith discovers that Lucas belonged to the youth choir run by junior choirmaster Jim Postlethwaite, a charismatic man who is determined to make a success of the choir even if some of the clergy at the cathedral are sceptical. Lucas had dropped out of school following the death of his mother some months earlier. His father had never been on the scene & his only relative was his mother's younger brother Adam, an ex-soldier & alcoholic. Lucas's best friends Vernon & Anna, known as V & the Dot, are shocked by his death but unwilling to give Faith or the police much information. As Faith struggles to balance her busy work life with her sister's increasingly urgent demands that they talk about their mother's health, she also becomes more involved with the investigation into Lucas's death. Everyone involved has secrets they are determined to keep but murder tends to reveal much more than just the name of the murderer & this case is no exception. This is the first mystery & the first contemporary book I've read in a while. A mention of The Reluctant Detective on a blog somewhere reminded me that I downloaded this second book & hadn't yet read it. That's one of the disadvantages of a Kindle, it's so easy to forget what I have on it. Discovering that the third book in the series, A Saintly Killing, is due to be published next month, made me want to read this one immediately. I'm so glad I did because I enjoyed it just as much as the first book. Faith is such a sympathetic character & her great enthusiasm for her new life & vocation is very touching. This time, we learn a little more about some of her parishioners, particularly spiky Pat Montesque & Faith also has a little flutter of romance with Jim Postlethwaite. Unfortunately taking him along for dinner with Peter Gray & his wife is a disaster when Ben Shorter turns up with his date, the pathologist working on the Lucas Bagshaw case. Jim's uneasiness & Ben's antagonism make for a very uncomfortable evening. It shows Faith how difficult it can be to separate work & friends & her previous life in the Force from her new life in the Church. I enjoyed all the details of Faith's working life & her tentative relationship with a cat she calls The Beast is also endearing if you happen to be a cat lover. We know who's going to come out on top there. I'm very much looking forward to reading the next book in the series & I'm determined that it won't get lost on my Kindle. I'm going to read it before it disappears from that first screen! 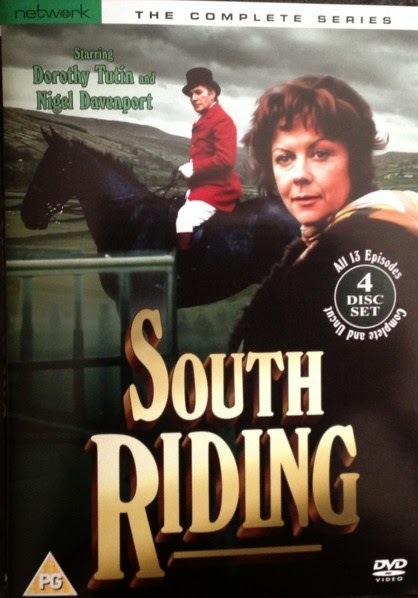 I recently finished watching the 1974 adaptation of Winifred Holtby's South Riding. It was in 13 parts & it was so good that it reminded me what I loved about so many of the more expansive literary adaptations I remember from the 1970s & 1980s. For those who don't know the story, it's a picture of the fictional South Riding of Yorkshire - there are only three real ridings, North, East & West. Sarah Burton returns after some years away from home as a teacher in South Africa, to apply for the position of Headmistress at Kiplington Girls School. She gets the job & tries to instill her love of learning & her ambition into all her pupils. On the school's Board of Governors, her natural antagonist is Robert Carne, the local Squire & landowner, now fallen on hard times as he struggles to keep his estate going while paying for his wife to be cared for in an expensive nursing home. His highly strung daughter, Midge, becomes a pupil at the school. Alderman Mrs Beddows (based on Holtby's mother, Alice), is also on the Board & is a close friend of Carne. Lydia Holly lives with her large family at the Shacks, the local slums. Lydia won a scholarship but has to leave school after her mother's death to look after her feckless father & younger siblings. The Council is split between the progressives such as Alderman Snaith & Joe Astell & the conservatives like Carne. There are many more characters &, as well as the personal stories of Sarah, Robert, Mrs Beddows & Lydia, it's a wonderful portrait of local council & the opportunities for corruption that exist there. Set in the 1930s, a time of unemployment & economic depression, it is an absorbing story. South Riding was also adapted for television in three parts in 2011. Although I watched this new version & enjoyed it, three hours was never going to be long enough to tell such a complex story. What I really noticed though, was just how much more real the actors & locations were in the 1974 version. I think this is a trait of most modern classic adaptations. The actors are too pretty! Nigel Davenport looked like a man in his 50s who had experienced great misery in his life. Hermione Baddeley was just heartbreaking as Beddoes, with her horrible husband & her tenderness for Carne. 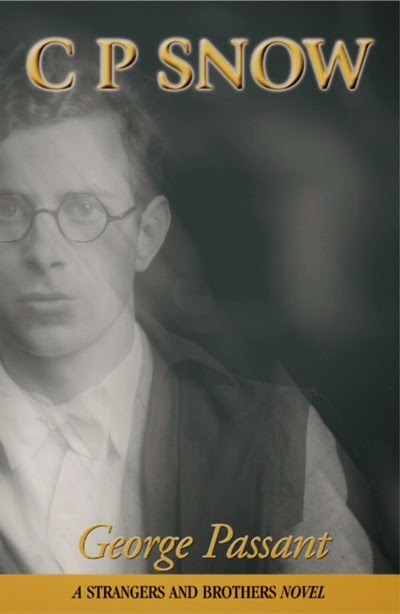 Joe Astell, played by Norman Jones, looked like a man who'd had tuberculosis & wasn't completely well. I'm afraid Douglas Henshall never convinced me of that. Lydia Holly, played by Lesley Dunlop, looked grubby, her uniform was different, shabbier than that of the other girls at school. Her home life was squalid, with screaming children & her poor worn out mother & the hopelessness of knowing that she would never get ahead without an education. Above all, Dorothy Tutin was magnificent as Sarah, so passionate & determined & bolshie. I also loved the sets. I could smell those horrible cloakrooms at the school, that Sarah fights so hard to change. Carne's home, Maythorpe, desperately trying to keep up appearances as the money ran out & Carne was left at one point trying to get a job in Manchester as a riding instructor. Nobody in modern adaptations looks grubby or unwashed. Clive Swift played Alderman Huggins with the most disreputable ginger beard I've ever seen. Maybe it's because the earlier version was made only 40 years after the book was written, maybe it was the way the series was shot, maybe they just didn't have the money for grand sets & prettiness but there were no beauties in the 1974 version although it was filmed on location in the East Riding. The beauty came from the acting, the gorgeous theme music by Ron Grainer & the script by Stan Barstow who wrote A Kind of Loving, one of the working class novels of the late 50s that changed British fiction. 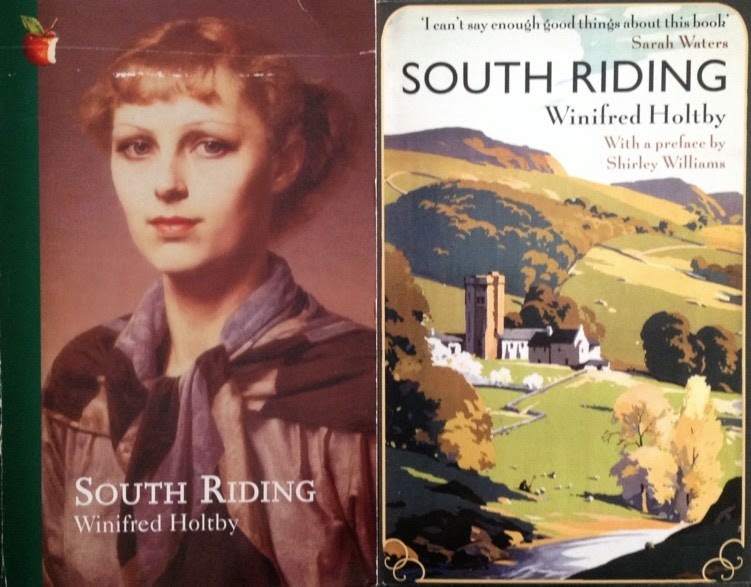 Winifred Holtby's novel is wonderful, one of my favourites, although it took me a few tries to get on with it. The first chapter is set in a Council meeting, setting the scene for the political machinations & personal relationships that will influence the plot. I know I'm shallow, but the copy we had at the library was a very uninspiring hardback with a plain green cover & I just could not get past that first chapter or the long list of characters that preceded it. It wasn't until I bought a copy of the book in Virago green that I got past Chapter One & raced through the rest of the book. I also couldn't resist buying another copy in the beautiful reprint covers Virago published a few years ago. 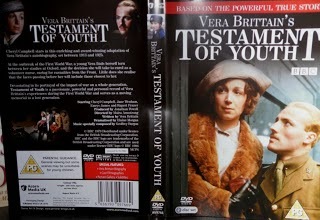 Another favourite adaptation from this period is Testament of Youth, from the book by Winifred Holtby's great friend, Vera Brittain. A new film of the book is being made at the moment & I'm sure I'll go & see it, I won't be able to resist. The trailer is here & it all looks very glossy & pretty. But, I can't imagine it will affect me as the book & television series did.